Legend has it that this tradition, which means “checking,” dates back to Biblical times, when Jacob was tricked by his father-in-law Laban. Jacob was presented with an already-veiled bride; he discovered only after the ceremony that she was not his intended bride, Rachel, but instead her sister, Leah. 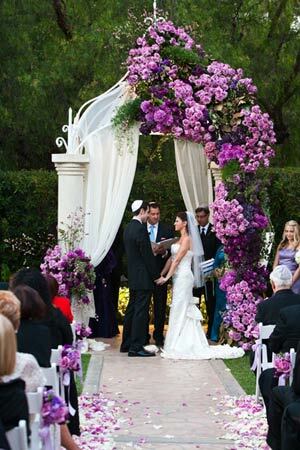 Often we will include Veiling of the Bride either immediately following the Ketubah signing, or as part of the processional to the Chuppah. By checking under the veil, the groom indicates that he is sanctifying the bride to be his wife. 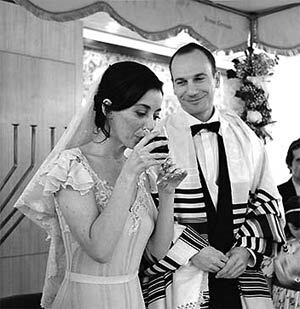 The second section of the wedding ceremony begins the Sheva Brachot, or seven benedictions, which are recited over a cup of wine. The blessings thank God for the fruit of the vine, the creation of the world, the creation of human beings, the perpetuation of life, the survival of the Jewish people, the joy of marriage, and the bride and groom’s happiness. 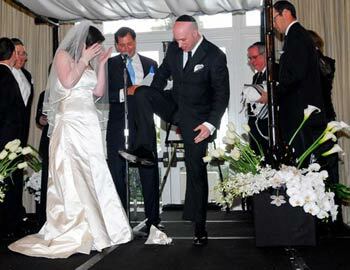 At the conclusion of the ceremony, it is customary for the groom to break a glass. The breaking of the glass has several meanings. Some consider it a reminder of the destruction of the Temple in Jerusalem in the first century, for even at the height of personal joy, we must not forget the tragedies that our people have endured. Others explain that the fragile glass reminds us of the delicate nature of marriage, which must always be cared for and cherished. 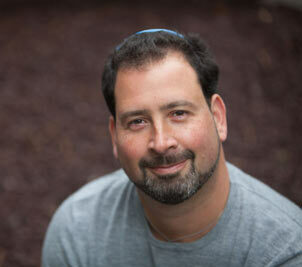 At the sound of the breaking of the glass, guests traditionally clap and chant “Siman Tov” and “Mazal Tov,” Hebrew phrases which offer congratulations and good luck to the couple.